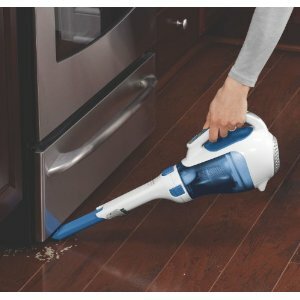 Black and Decker’s Dustbusters have always been and important and handy household tool. The 14.4 volt Cordless Hand Vac is just so awesome it is worth a mention here. It is more than powerful enough for the pickups – quick or extensive – around the house. It has a brush that can be flipped down for use or flipped up when you don’t need it. The brush is attached to the unit so it’s there when you need and you don’t have to look for it. The unit has a pull-out wand, which is great for tight spots. The wand is also attached. Maintaining the unit is so simple. It can be dis-assembled and re-assembled in a few seconds. The clear canister lets us see when it’s time to remove the dirt and dust, which we do with our larger Meile canister vacuum. This way the dust does not get re-admitted into our home! The battery lasts and lasts. We’ve been using this B&D hand vac daily for more than a year and there has been no sign of weakening. Not only is it practical and efficient, its design is attractive. Black And Decker lists it at $72 but places like Target, Bed Bath and Beyond, Amazon have it available less than $40.